Israeli soldiers abducted, on Sunday at dawn, four young Palestinian men in Beit Ummar and Halhoul towns, near Hebron, in the southern part of the occupied West Bank. 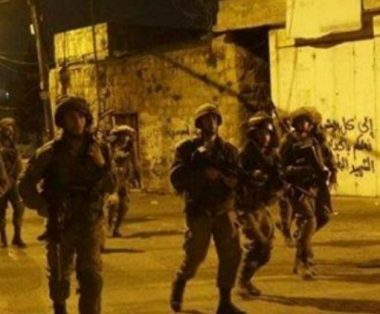 The soldiers invaded and searched homes in Beit Ummar town, north of Hebron, and abducted three former political prisoners, identified as Mohammad Ayesh Abu Hashem, 20, Hamza Samir Abu Mariya, 19, and Wasim Taha Abu Mariya, 18. The three Palestinians were cuffed and blindfolded before the soldiers took them to Karmie Tzur illegal colony, and Etzion military base. It is worth mentioning that the Israeli army said its soldiers arrested eleven Palestinians in several parts of the occupied West Bank, and confiscated weapons in Anata town, near Jerusalem.